My Quilt as you go project is nearing completion. I am so excited! 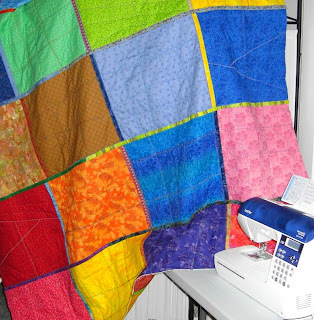 Once I get it trimmed and put on the binding, I will have a nice bright colorful new quilt for my bed. I was told that I should have kept the first quilt I made. However, I was making that first quilt as a present for my niece. I had a deadline and even though I tried to machine quilt it, I gave up on that and tied it. My second quilt top is still in the bag waiting for a trip to get longarm quilted. I am not sure when that will happen. But, this one is bordering (pun intended) on a finish! I used a semi-crazy quilt technique. It is also a stack and whack technique. So there are four blocks of each "design." The blocks are nice and large, roughly 16 by 18 inches, so I could finish quickly. I basically used fat quarters and then trimmed the blocks to size. The back of each block is made of a solid piece of fabric. For joining strips, I just cut strips off the edges of fabric in my stash and/or leftovers from making the blocks. (Hey, I didn't buy it all as fat quarters. Some of the FQs were cut from yardage as needed) Here is a peek at the back. In case you are wondering, I have a room divider next to the sewing table. I use it as a place to hang strips or pin pieces if I need to. It is a frame with off-white fabric as the divider and it is very handy right there! I like it, and yes you should keep your first quilt. But don't tell anyone I never did either. It is absolutely beautiful. I must learn how to do that.. I LOVE IT..
Love the quilt...awesome job. Glad to know that there are others that tie a quilt when in a pinch. Good job, I love the colors. I really need to try that technique. That is so fun! 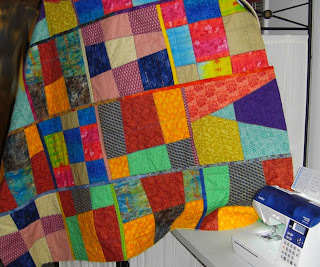 I love the colors and the "crazy quilt" look of it. Wow that is some serious color! I like the back as much as the front. That looks really nice! Good job! I do not believe that you really a quilter....until.... how I wish that my hubby could do the same!!! Nice quilt. Well done.